Cast: Denzel Washington, Paula Patton, Val Kilmer, Jim Caviezel, Adam Goldberg. Story: Cops use a new time device to track down a terrorist. Last time Tony Scott and Denzel Washington teamed up it was in the hugely underrated Man on Fire - so this should be good. That's weird, it feels like I've written that before. Tony Scott is "Alien" Ridley Scott's little brother and so far he's doing pretty well. Last time out was Domino, which wasn't the best movie ever, but it was certainly stylish. With Deja Vu, the style has been turned down a notch, giving Denzel the space to perform as we all know he can. 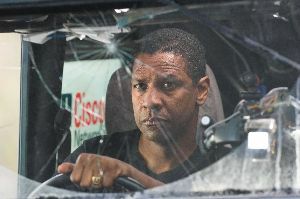 It's effective, because Denzel is so good at this kind of role. He's a cop (isn't he always?) on the trail of the terrorist who blew up a ferry and in the process gets involved with a special team using a natty little device that lets them see four and a half days in the past. That's as much as I'm going to tell you - it gets a lot more complicated than that, and the temporal aspect of it is utter nonsense. But then any movie involving any form of time travel is usually pretty nonsensical - but at least The Jacket didn't directly contradict itself in its wacko theories. Anyway, that's not really important. Deja Vu is actually very good, it kept me captivated and thinking the whole way through. The massive flaws in the basic ideas didn't affect my enjoyment significantly, and the fast pace evident in most Tony Scott movies meant that there was always something happening to take my mind off it. Denzel is typically classy and is supported well by Paula Patton, Jim Caviezel (last seen as bleeding Jesus) and the rest of the cast - though it seems strange that Val Kilmer was used so little. The action is well realised but is a mite overplayed and daft - again, that didn't trouble me too much, but it will bug some viewers. The movie sits half way between action and plot - and although neither of those sides are particularly good, somehow they go together very well. It should be a bit rubbish, but it's not. 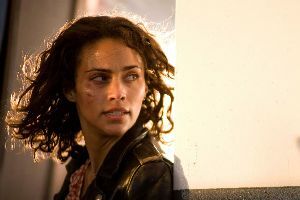 Testosterone Satisfaction Rating: 3/5 - some good action and a dark look at Paula Patton in the shower. Deja Vu was released in the UK on 15th December.